Max Devrient was the son of the actor Karl Devrient and a grandnephew of Ludwig Devrient. His mother was the actress Johanna Block. He debuted in Dresden in 1878 as Bertrand in Schiller's "Die Jungfrau von Orleans". He toured Germany before he was engaged at the Burgtheater in Vienna in 1882, where he debuted in Schillers's "Die Räuber". He worked for many years at the Burgtheater, where he played Mephisto, Wallenstein, Ceasar and many other parts. From 1920 onwards he also worked as a director for the Burgtheater. In 1895 he had married the actress Babette Reinhold. After he divorved her he married her sister, Regina Maasch. 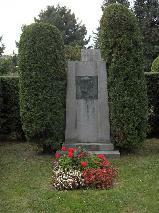 The grave of Max Devrient at the Zentralfriedhof, Vienna.